Scandal in the church as Cardinal 3rd in line from the Pope—Cardinal George Pell is accused of sexual offences in Australia. For decades now, the Catholic Church has been a subject of sexual offences involving the clergy. A series of seemingly never ending incidents and accusations that has done more to Mar the integrity of the church than politics and war. Police reports reveal that Cardinal Pell, who has long been accused of mishandling the church's response to clergy abuse scandals in his native Australia, might himself have been one of the abusers . Australian police say the 76-year-old Vatican treasurer faces "multiple charges in respect of historic sexual offences" involving more than one accuser, Reuters reports. Australian police have ordered the highly respected Pell to appear before a court in Melbourne a summon he fully intends to honour if his doctor permits him to travel. According to a Church statement the disgraced Cardinal is looking forward to his day in court so he can clear his name. 2. Bishops—Also called Archbishops or Major-Archbishops. So were do Cardinals come in? In truth, Cardinals have no power in the Catholic Church. They are personally selected by the pop from 2946 Bishops and given the additional Cardinal title. 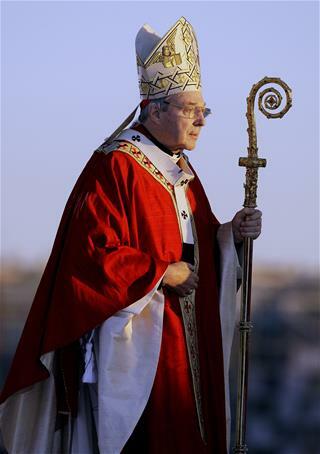 George Pell is a Cardinal who is third in line from the Pope in terms of hierarchy. Full details of the allegations have not been revealed. Pell was a parish priest in Victoria in the 70s before becoming Archbishop of Melbourne. It was reported that the Pope sent him to Australia to Clean up the Church there. The criminal charges are now claiming that he did the exact opposite. The Pontif has declined from making comment on the case, saying he would wait for the law and Justice to have their say first.